One of the most important aspects of each marketing strategy is the target group approach. The „Wo?“ As well as the „how?“ A decisive role. Encourage potential customers where they are most likely to respond to your message. Digital advertising displays in your sales rooms or at other places of use put your advertising in the best possible light. This is where friendlyway comes into play: for years we have been among the international market leaders for presentation systems such as large-format displays and digital signage solutions. We provide you with adequate screens for your marketing project or for other purposes in various dimensions. Rely on our expertise! Our service portfolio is aimed at retail companies as well as banks and public institutions. If necessary, we will, in consultation with you, set up branch-specific solutions so that your customers or visitors can optimally absorb what is presented. Digital commercial displays have become an indispensable part of the retail industry – and this is no longer just the case for electronics shops. This makes your customers new products as well as special actions particularly tasty or satisfying with explanatory videos their information needs. Depending on your requirements, you can also send out image videos of your company or TV news, in addition to product commercials – the possibilities are nearly limitless. In addition to providing our display systems, we also support you with regard to the software required for operation. We develop these for your individual needs, and, of course, we provide help with implementation. Thanks to centralized management, you can control the image output for all devices from a main computer. 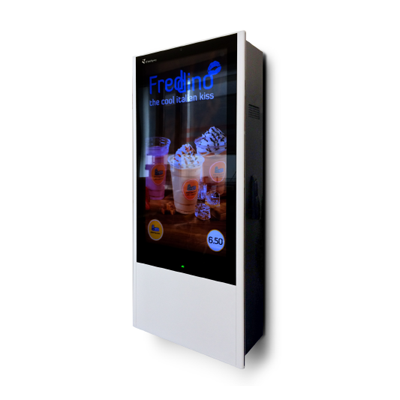 Our portfolio goes far beyond digital advertising displays: If you want to create digital kiosks that allow interaction via touch screen, friendlyway is also your expert contact. This makes it possible to implement „Interactive Digital Signage“ solutions (way guidance system), which will surely leave a good impression on your visitors.